Lungwort (Pulmonaria officinalis) - Helps you to move beyond duality to find dynamic balance between the “unseen and the “seen.” As your two lungs operate in unison helps you to integrate opposite aspects of yourself into harmonious living. 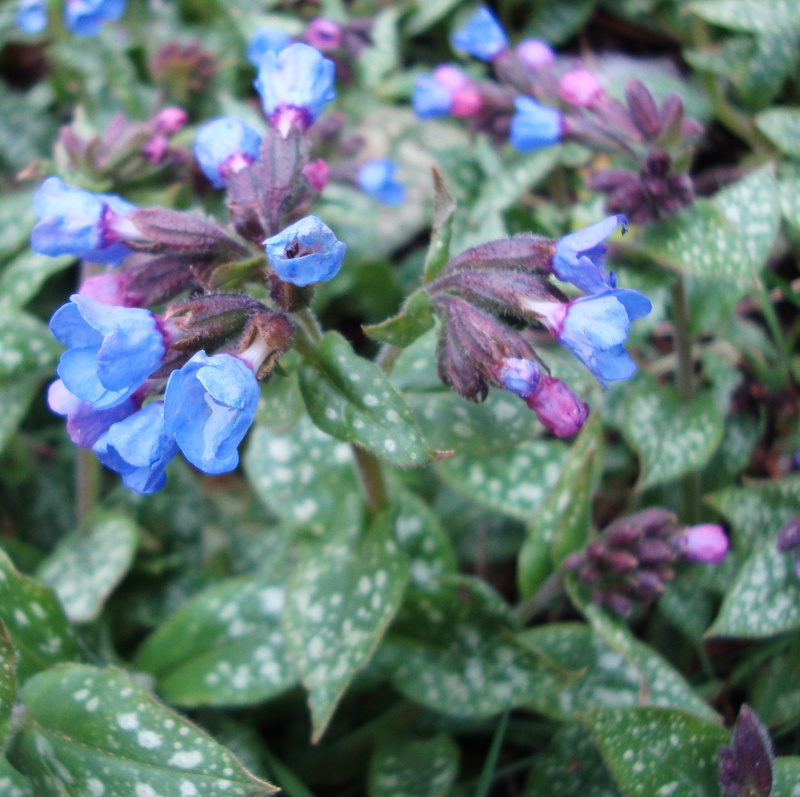 Native to Europe and the Caucasus, lungwort is an early blooming garden ornamental and medicinal herb that has scalloped funnel shaped flowers in small bunches that start pink then turn to blue. Its green leaves with little white blotches are said to resemble lung tissue and it is used to treat lung conditions such as bronchitis, chronic coughs and asthma. Having difficulty slowing down, connecting with yourself and finding balance in your life. You may be living as if duality is the only reality. This could show as an inability to find harmony between opposites, such as male and female aspects of yourself. You could be unwilling to recognize or accept the influence of “unseen” energies and higher dimensional influences in your daily life. Or you may want to better integrate the “unseen” into daily life but can’t establish a strong connection. Most of us operate from a mindset of duality. We tend to focus on right/wrong, yes/no, good/bad etc. within ourselves and in our daily life. As your two lungs operate in unison, Lungwort Flower Essence helps you to integrate opposite aspects of yourself into harmonious living. At a deeper level, Lungwort Flower Essence helps you to move beyond duality to find balance and harmony between the “unseen and the “seen”. Take a computer for example. We see the words and images on the screen. Yet we don’t see the electrons moving through the system making everything work. And we don’t see the series of zeros and ones underlying the code that makes the program function. A personal example for Diana is sensing the connection with the plant spirit who downloads the unique imprint of Lungwort. She doesn’t actually see the vibrational download that creates this essence, yet she know that it is happening and when it is finished. At this level, the Lungwort Flower Essence helps you to come into dynamic harmony with the “unseen” that underlies your daily life. And Lungwort Flower Essence reminds you to slow down and soften by connecting with your heart. This essence was made by the “no-pick” method of working directly with the plant spirit. Crystals of amber, angelite, blue celestite, drusy quartz, icosahedron cut quartz, microcline, nirvana quartz, Peruvian pink opal, pink cobalto (clear) calcite, prehnite and rose quartz were placed among the plants with the storage (mother) bottles during this process. The sun acts as a transformer to step down spiritual energies from higher dimensions. While the essence was being made, Amber acted as a lens to receive and focus sunlight for this purpose. Amber aligns the subtle bodies with the physical bodies, transmutes negative energy into positive energy, and emits a sunny and soothing energy that calms and enlivens the disposition. Angelite is a stone of tranquility that invokes inner peace. It connects you with your angels and spiritually aligned guides. Blue celestite balances enhances inner vision and connection with your Higher Self, angels and spirit guides while staying calm and centeredness in daily life. Drusy quartz crystals help to energize and stabilize your subtle bodies. Icosahedron cut quartz has 20 (5X4) equilateral sides. It is a bridge between the 5th Dimension - the entry into the unified Spiritual realms - and the 4 cardinal directions (N, S, E, W) on Earth. Microcline, blue green (amazonite) stimulates clarity of thought and enhances general understanding. It invites you to speak and live in alignment with your highest truth and integrity. Nirvana quartz brings your heart and mind into synergistic communication, and promotes inner silence. It attunes you to the human evolutionary process, inner radiance, and ability to overcome difficult processes with beauty and strength. Peruvian pink opal clears and calms the heart and brings a sense of peace and tranquility. Pink cobalto calcite is a stone of love patience and gentleness. It embodies deep compassion, emotional healing and joy, while balancing your feeling-oriented and action-oriented aspects. Prehnite enhances heart-centered communication - both sending and receiving – with your Higher Self, angels spirit guides and all of creation. Rose quartz encourages gentleness, emotional healing, and uniting with the Divine through the heart chakra; it shifts your body from a stress-based physiology to a higher frequency Love-based physiology. While the Lungwort Flower Essence was being made, imprints of rattle, blue heron feather and spirit song coming through Diana’s voice were infused into the essence.